The discussion on the new tax law, passed by the Senate late on December 31 and by the House late on January 1, focussed on whether income tax rates should have been allowed to revert to what they were during the Clinton years for the well off (incomes over $250,000), the rich (incomes over $450,000), or the extremely rich (incomes over $1,000,000). The final law, which Obama said he will sign, sets the break at $450,000. But there is much more in the new law as well. Many of its provisions will affect the poor and middle classes, so the federal taxes they will pay will also go up in 2013. Especially important will be the end to the 2% point reduction in the payroll tax rate, which has been in effect since the start of 2011. These impacts have been less discussed, but in the aggregate they will account for substantially more of the revenues that will be generated than the impact of the reversion to previous income tax rates on incomes over $450,000. 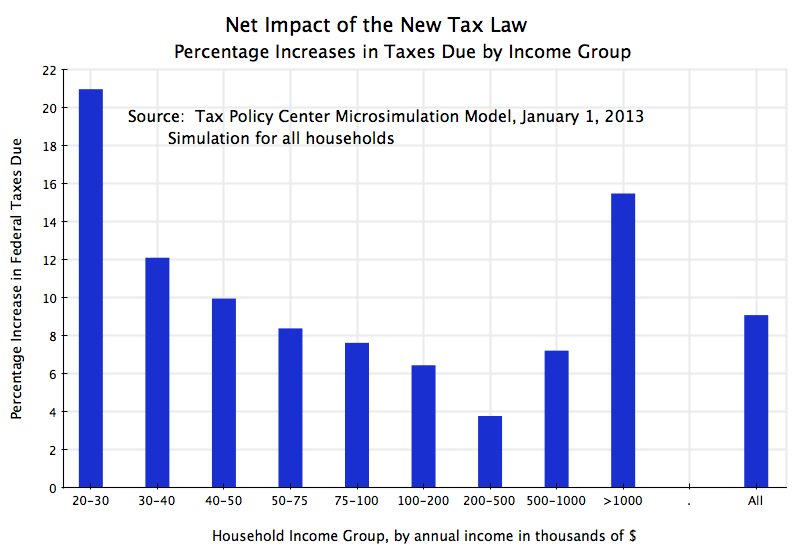 The non-partisan Tax Policy Center has estimated what the impacts will be by household income level of the new law. The analysis uses their microsimulation model. The model is based on data from a large sample of actual tax returns, to determine what the different income sources are by category of household. Hence it can determine with some accuracy the impact of changes in the tax code. The graph above shows how much average taxes would rise in 2013 in percentage terms under the new law, for households classified by income category. The Tax Policy Center also included two lower income groups (income of less than $10,000 per year, and income of $10,000 to $20,000 per year), but I have left these off of the graph. Such very low levels of taxable income will be dominated by special groups, such as students with summer jobs, and may not be representative of actual households. The official government poverty line for a family of four in 2012 was $23,050. The taxes due are also quite small on average as one is averaging in many with a zero tax liability. As a result, the percentage changes can be huge. For those interested, the percentage increases that will result from the new tax law was 73% and 151% for the two groups, respectively. But it is not clear that these figures are meaningful. But the pattern seen among the other groups is significant, and interesting. Those in the lowest income categories will see the largest percentage increases in their taxes due (by 21% for those earning between $20,000 and $30,000), with this then steadily declining to just a 3.8% increase for those earning between $200,000 and $500,000. This then rises to an increase of 7.2% for those earning between $500,000 and $1,000,000, and to an increase of 15.5% for those earning over $1,000,000. This is not terribly progressive. Under a progressive scale, the percentage change would have been smallest for the poorest, and then rise steadily as one goes up the income scale to the richest. But here one has the steepest increases for the poorest, with this declining steadily until one reaches an annual income of $500,000. Only then does it start to rise. And the percentage increase for those earning between $500,000 and $1,000,000 is less than the increase for those earning anything up to $100,000. The percentage increase for those earning over $1,000,000 is less than the increase for those earning less than $30,000. The reason for this is largely the impact of ending the 2% point reduction in the payroll tax. This had been introduced with effect from January 1, 2011, on the initiative of President Obama, as a mechanism to help especially the poor, as well as an economic incentive to businesses to hire more workers rather than use more machines (by reducing the relative cost of labor). It would also have an especially strong stimulative effect, as the tax cut would be focused on relatively lower income workers who would likely spend most of the extra income, thus generating demand. And while the 2% point reduction in the payroll tax was always viewed as temporary, some would question whether it is best to end it now, as opposed to next year or the year after. The payroll tax is used to finance Social Security. While the 2% point reduction was in effect, the US Treasury transferred an equal amount to the Social Security Trust Fund. The amounts transferred were $103 billion in 2011 and an estimated $112 billion in 2012. Projecting this forward, the amount needed would have been about $120 billion in 2013. The figures underlying the graph above from the Tax Policy Center estimate that the aggregate increase in tax revenues in 2013 across all income groups (relative to what they would have been had 2012 law been extended into 2013) would have been about $200 billion ($199 billion to be more precise). That is, the end of the 2% point reduction in the payroll tax accounts for 60% ($120 billion of the $200 billion) of the increase in revenues. All the other changes, including the increase in the tax rates for those earning over $450,000, the phasing out of deductions and exemptions for households with incomes over $250,000, the increase in the capital gains tax rate to 20% from 15% for those earning over $450,000, and the other changes, only account for 40%. Consistent with this, the Tax Policy Center figures indicate that 57% of the extra revenues generated will come from households of income $500,000 or less (they do not have a break point at $450,000). Indeed, 33% comes from households of income of $100,000 or less. Only 43% will come from households of income above $500,000. The debate on this new tax law has centered on how much the rich should pay in taxes. But the final law, as passed, is far from focussed only on taxes the rich. The steepest increases will be borne by the poor, and the poor and middle classes will account for most of the revenues that will be raised. This entry was posted in Fiscal Issues and tagged policy, tax system, taxes by aneconomicsense. Bookmark the permalink.